In 2013, the International Maize and Wheat Improvement Center (CIMMYT) and the Kenya Agricultural & Livestock Research Organization (KALRO) jointly established the MLN screening facility at the KALRO Naivasha research station in Kenya’s Rift Valley with support from the Bill & Melinda Gates Foundation and the Syngenta Foundation for Sustainable Agriculture. MLN was first discovered in Kenya in 2011 and quickly spread to other parts of eastern Africa; the disease causes premature plant death and unfilled, poorly formed maize cobs, and can lead to up to 100 percent yield loss in farmers’ fields. 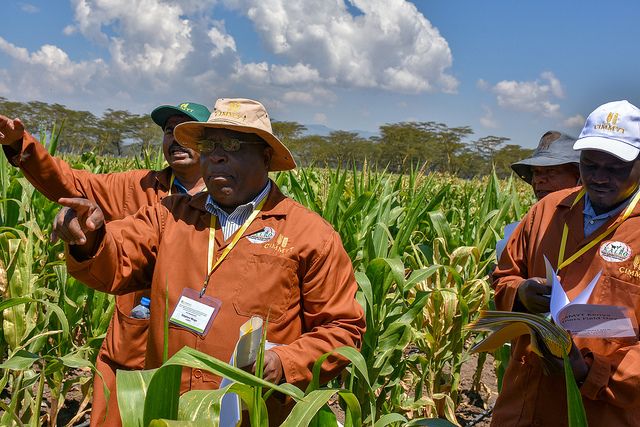 CIMMYT and partners are dedicated to stopping the spread of this deadly maize disease by effectively managing the risk of MLN on maize production through screening and identifying MLN-resistant germplasm. The MLN screening facility supports countries in sub-Saharan Africa to screen maize germplasm (for hybrid, inbred and open pollinated varieties) against MLN in a quarantined environment. This is the largest dedicated MLN screening facility in Africa. Since its inception in 2013, the facility has evaluated more than 175,000 accessions (more than 253,000 rows of maize) from more than 15 multinational and national seed companies and national research programs. Partners can now plan for annual MLN Phenotyping (Screening / Indexing) during 2019 with the schedule below. The improved and streamlined approach for MLN phenotyping should enable our partners to accelerate breeding programs to improve resistance for Maize MLN for sub-Saharan Africa. More information about the disease and resources for farmers can be found on CIMMYT’s MLN portal.